About 5 minutes before the event, from mid-northern latitudes. Individual views will vary, however. As the Moon makes its monthly circuit around the sky it often passes in front of stars, blotting them out for as much as an hour or so. Such an event is called an occultation (derived from the Latin word occult?re, which means "to conceal"), and it can be a startling spectacle, especially if the star happens to be bright. The star appears to creep up to the Moon's limb, hangs on the edge for a minute or two, and then, without warning, abruptly winks out. Later it pops back into view just as suddenly on the Moon's other side. A nifty holiday gift occurs for those living in parts of western and central Canada, the Pacific Northwest and parts of the Rockies and Plains States on Christmas morning when a fat waning crescent Moon will occult the bluish 1st-magnitude star Spica, one of the brightest stars in the sky. from much of the central and eastern United States, the Sun unfortunately will have already come up when the Moon covers Spica. The star's reappearance will be spectacular wherever the Moon is up in a dark sky, but such an opportunity will be confined to parts of western and central Washington State, a very small slice of north-central Oregon, as well as far-western Canada. In these areas, the sky will be completely dark when Spica springs into view from behind the Moon's dark edge. Its sudden emergence should be able to be seen with the unaided eye if you have good vision, however the Moon's glare might hinder the visibility of Spica. So block as much of the Moon's sunlit portion as you can with a finger, a telephone pole or the edge of a building at least 20-feet away. Binoculars will pull the star in well, and a small telescope will afford a superb view. Those living east of a line extending roughly from Grande-Prairie, Alberta to Burns, Oregon will see Spica emerge during morning twilight; the farther east you go, the brighter the sky will get. For those who live east of a line running from about Riverton, Manitoba to near Albuquerque, New Mexico, Spica will unfortunately reappear after sunrise. Nonetheless, the Moon should still be visible and provided that it is not too hazy, a good telescope should also bring out Spica as a tiny speck against the blue sky. For those living in central and eastern North America, the occultation will occur after sunrise in a daytime sky. Before dawn breaks, viewers will see Spica positioned to the lower left of the Moon; the pair getting noticeably closer together as the twilight sky brightens. People residing in the Far West or Desert Southwest states will find themselves outside of the occultation zone. The Moon will appear to glide just to the north of and narrowly missing Spica during the dawn hours of Christmas morning. In the table, we provide a timetable for 16 selected locations, giving the local times and the Moon's altitude for both Spica's disappearance and reappearance. A single asterisk (*) means the event occurs during morning twilight. A double asterisk (**) means the event occurs after local sunrise. Cities in this table that will see the entire occultation in a dark sky are Boise, Edmonton, Seattle and Vancouver. The information is based on predictions by the International Occultation Timers Association (IOTA) and has been rounded off to the nearest minute. For more detailed information, including maps of the occultation zone, as well as times for more than 300 cities in North America, see this site. 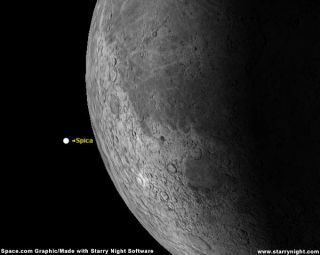 Viewers in eastern North America will get a chance at seeing a waning gibbous Moon hide Spica late on the night on Feb. 17, 2006. On May 10, 2006 a waxing gibbous Moon will cover Spica. The region of visibility will encompass much of North America, but unfortunately the occultation occurs before sunset. Other parts of the world will have their chance at seeing the Moon occult Spica on a monthly basis through January 2007. These include Hawaii (March 17, 2006) Eastern Europe (April 13, 2006), Japan (June 7, 2006), parts of Australia and New Zealand (Aug. 28, 2006).